While Banksy prefers to operate in the shadows, he does have a YouTube account where he uploads some background info. This is what he did after a stunt at Sotheby's in October. Today, this video has disappeared. Assuming that it's not another 'prank,' the French media outfit Canal+ is responsible. Banksy is without a doubt one of the most mysterious yet best-known street artists in the world. His works are the most sought after in their genre for which collectors are happy to pay serious cash. One of his paintings was sold at Sotheby for £1.4 million in October, which is a reasonable amount. However, as soon as the hammer went down a built-in shredder tore half of it to pieces. Apparently, Banksy had built a shredder into the painting, carefully planning his ‘stunt,’ which carries a deeper criticism of course. The stunt was widely covered in the media and also documented by Banksy on his own YouTube channel. The street artist rarely uploads anything so media outlets were keen to republish the video, which offered a behind-the-scenes perspective on the shredding. Apparently, the French media giant Canal+ used the material as well. However, they went a step further and have claimed it as their own, asking YouTube to remove the original, which it did. “Video unavailable This video contains content from Canal Plus, who has blocked it on copyright grounds,” a message now reads instead. The issue was picked up by professional engineering YouTuber Dave Jones on Twitter. 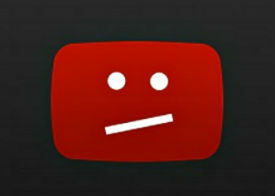 He describes YouTube’s takedown system as a joke, adding that Canal+ should love its Content ID privilege. 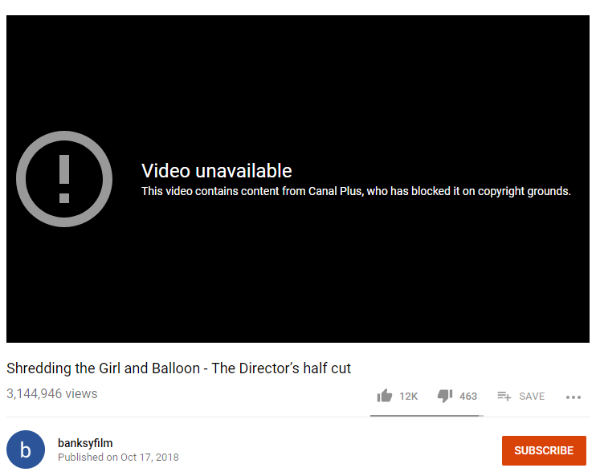 While it’s not entirely clear how this happened it’s likely that Canal+ used Banksy’s video in its own programming, adding it to the Content ID system. That certainly would not be the first time this has happened. It’s impossible to summarize all mistakes, but the fact that a bird chirping and white noise videos were previously flagged as copyright-infringing content says enough. In all honesty, mistakes are bound to happen when a company operates on a scale as large as YouTube. On the other hand, opponents of EU’s proposed ‘upload filters’ under Article 13 will use it as an example of what can go wrong. In a few hours or days, this mistake will likely be corrected. However, there is certainly room for more balance. Right now, YouTube users can lose their channel after three copyright strikes, but rightsholders can make mistake after mistake. As for Banksy, we doubt that he’s seriously upset by any of this. He has seen some of his most iconic works being painted over in the past. Unlike with YouTube, these aren’t so easy to restore. Update: After a few hours the video was restored. But would the same have happened if this wasn’t a big name like Banksy? The header image was taken from another Banksy video, which is still online.